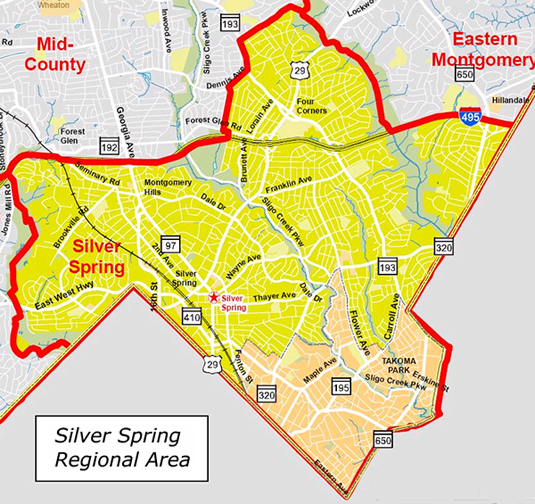 Silver Spring encompasses the area south of the beltway (plus Four Corners), east to the Prince George County line, south to the Washington DC line and west to Rock Creek Park. This booming area has been undergoing a renaissance since money was funneled there almost a decade ago. Now you will find new housing, restaurants, and entertainment like concerts, festivals, and markets. Great schools, convenient transportation, and affordable(ish) housing, are incredibly attractive to buyers; you can live a suburban life virtually car free with access to the redline. New houses are constantly springing up and even more are being built. A one-bedroom condo will run you around $200,000 and a single family home will run you anywhere from $350,000 to $1 million. The average price of a 2 bedroom detached home is $370,000 and 3 bedroom $465,000. Living here is like living in a Melting Pot, with a diverse population. The median age is 36, 42% of people own their homes, and 29% have children, according to the Washington Post. The area hosts some 150 restaurants, so everyone is happy with dinner.